Local insurance broker Tony Alford isn’t ready to completely pass the baton yet, but the next generation have started their trot. Tony’s company is reinventing itself as his current partners head out and the next generation of insurance agents comes in. Tony’s business, previously a faction of ASLR (Alford, Staples, Lapeyre and Robichaux) is becoming Alford and Associates. Tony thanked his former partners for their successful years together and wished them well going forward. He also expressed his gratitude to his customers for their continued business and support. “I’d just like to say thank you to our customers and good luck to my partners in their future endeavors,” Tony said. What Tony established with his partners he is aiming to continue to build upon with a new wave of insurance agents, many he knows quite well. 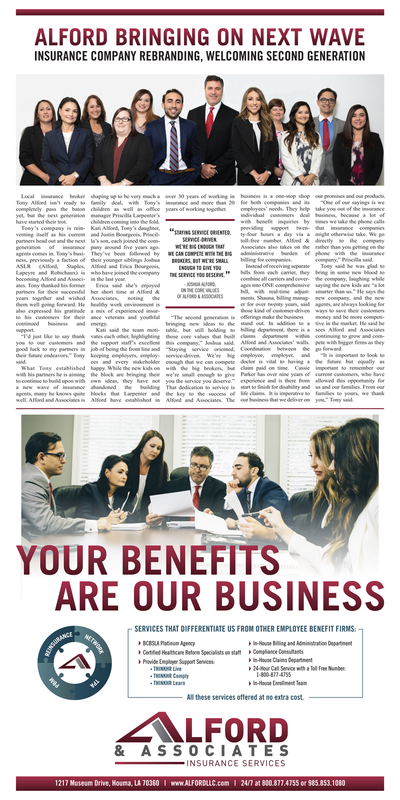 Alford and Associates is shaping up to be very much a family deal, with Tony’s children as well as office manager Priscilla Larpenter’s children coming into the fold. Kati Alford, Tony’s daughter, and Justin Bourgeois, Priscilla’s son, each joined the company around five years ago. They’ve been followed by their younger siblings Joshua Alford and Erica Bourgeois, who have joined the company in the last year. Erica said she’s enjoyed her short time at Alford & Associates, noting the healthy work environment is a mix of experienced insurance veterans and youthful energy. Kati said the team motivates each other, highlighting the support staff’s excellent job of being the front line and keeping employers, employees and every stakeholder happy. While the new kids on the block are bringing their own ideas, they have not abandoned the building blocks that Larpenter and Alford have established in over 30 years of working in insurance and more than 20 years of working together. That dedication to service is the key to the success of Alford and Associates. The business is a one-stop shop for both companies and its employees’ needs. They help individual customers deal with benefit inquiries by providing support twenty-four hours a day via a toll-free number. Alford & Associates also takes on the administrative burden of billing for companies. Instead of receiving separate bills from each carrier, they combine all carriers and coverages into ONE comprehensive bill, with real-time adjustments. Shauna, billing manager for over twenty years, said those kind of customer-driven offerings make the business stand out. In addition to a billing department, there is a claims department within Alford and Associates’ walls. Coordination between the employee, employer, and doctor is vital to having a claim paid on time. Cassie Parker has over nine years of experience and is there from start to finish for disability and life claims. It is imperative to our business that we deliver on our promises and our products. “One of our sayings is we take you out of the insurance business, because a lot of times we take the phone calls that insurance companies might otherwise take. We go directly to the company rather than you getting on the phone with the insurance company,” Priscilla said. Tony said he was glad to bring in some new blood to the company, laughing while saying the new kids are “a lot smarter than us.” He says the new company, and the new agents, are always looking for ways to save their customers money and be more competitive in the market. He said he sees Alford and Associates continuing to grow and compete with bigger firms as they go forward. “It is important to look to the future but equally as important to remember our current customers, who have allowed this opportunity for us and our families. From our families to yours, we thank you,” Tony said.